The Knowledge Workshop: Busy, busy, busy! So far, 2011 has been a busy year here at The Knowledge Workshop. We've been signing up new students from far and wide while looking at new and exciting opportunities for our trainee teachers. We have trained 30 new teachers so far this year, many of whom have taken contracts overseas. Popular destinations this year include: South Korea, Thailand, China, Vietnam, Cambodia, Denmark, Mexico and Brazil but you are by no means limited to these destinations. Our TEFL/TESOL training prepares you to work anywhere in the world! 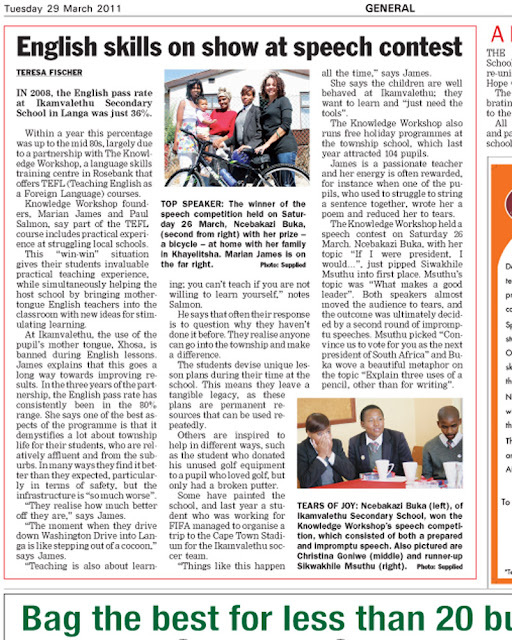 We have also just organised a highly successful speech contest at Ikamvalethu - assisted by some of our TEFL trainees - where the first prize winner received a mountain bike and accessories, supplied by TKW, and all 10 short-listed finalists received English Dictionaries, supplied by Oxford University Press. Aside from day-to-day excitement, we have been busy with various other improvements to the business, including joining the Cape Chamber of Commerce and Cape Tourism. We have now also started a website overhaul, which will be ongoing for the next few weeks. Send us your suggestions, contributions and testimonials, if you would like to be included! Please bear with us if you notice irregularities (or send an email to alert us) on the site during this time.